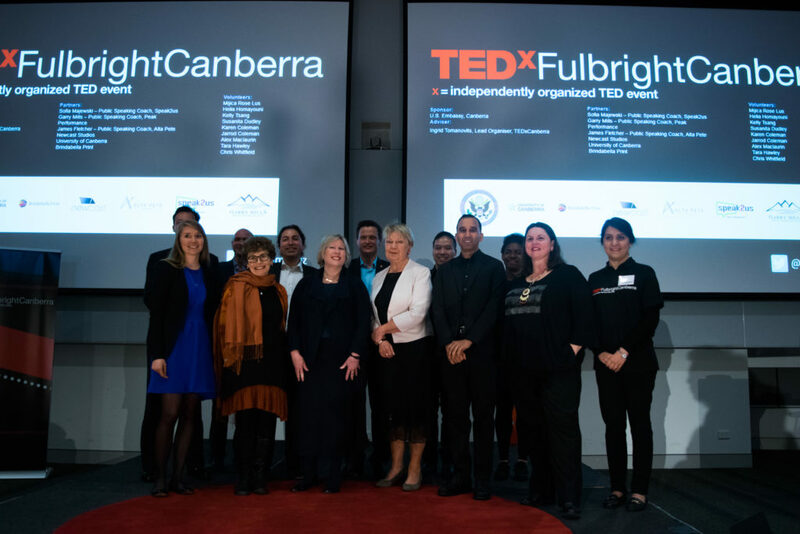 A fantastic roster of speakers wove their experiences, research, thoughts, and reflections into the theme of Empathy & Transformation at the first ever TEDxFulbrightCanberra event at the University of Canberra’s Ann Harding Conference Centre last night. The evening began with a welcome address from U.S. 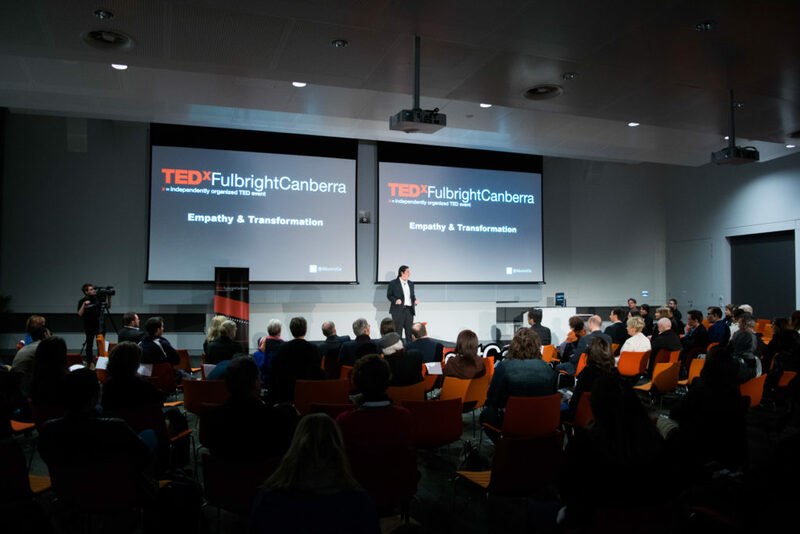 Charge d’affaires, Mr James Carouso, before 2013 Fulbright Postdoc alumna Michelle Evans kicked things off with a thoughtful take on the Power of Identities in Leadership. 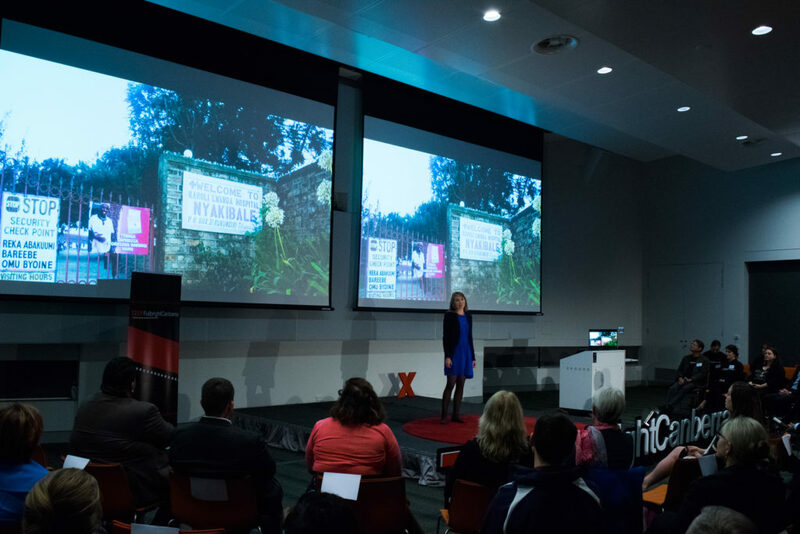 Drawing from her vast experiences of Indigenous entrepreneurship, Michelle positioned the voices of Indigenous Australians within a frame of leadership, exploring how having ‘outsider’ experiences and challenging ‘insider’ expectations can help uncover barriers to finding the authority to lead. 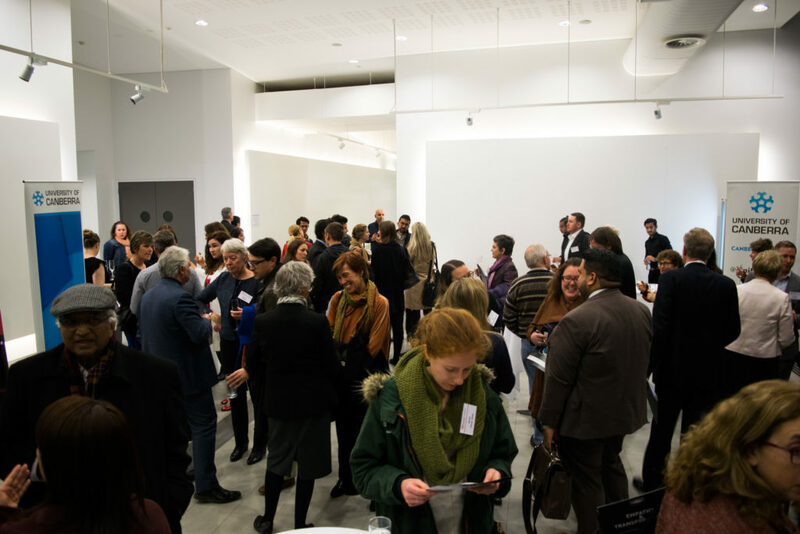 Next, 2003 Postgrad Scholar Nicholas Southwood looked at the concept of ‘feasibility,’ positing that limiting ourselves to a black-and-white interpretation of ideas as either feasible or infeasible can limit our potential for social advancement. Nick suggested that using feasibility as a yardstick, rather than a barrier, is a great way to set goals and achieve progress. 1991 Postgrad and 2002 Senior Scholar Kim Rubenstein then discussed The Vulnerability of Dual Citizenship in Australia, explaining her thoughts on why Australia should be affirming the multiple connections individuals have both in Australia and beyond in order to enhance social cohesion. 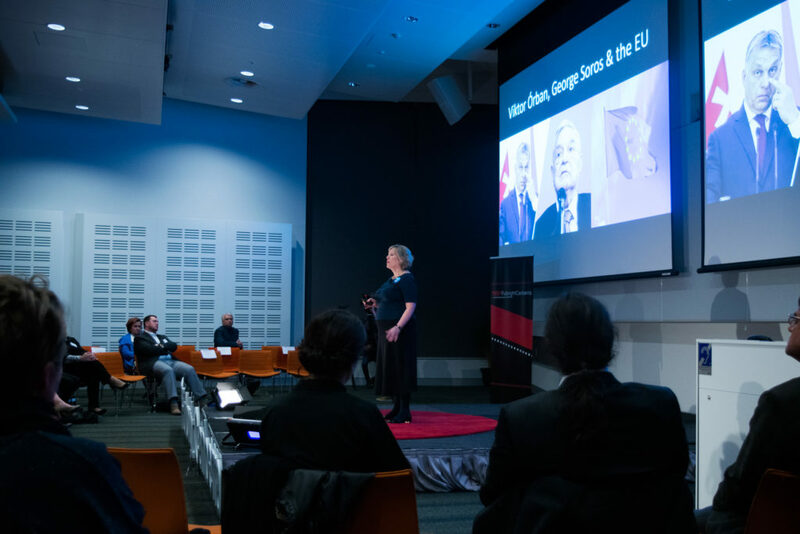 She then discussed her concerns about the trends towards an inequality of citizenship that dual citizens in Australia now experience, through changes to the Australian Citizenship Act in 2015. 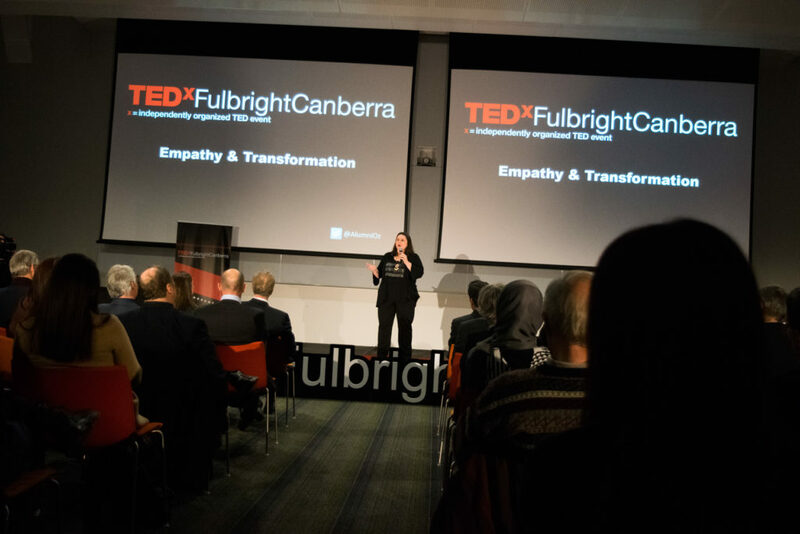 Katie Thurber, 2011 Fulbright Anne Wexler Scholar then discussed her thoughts on why is is damaging to view the health and wellbeing of indigenous peoples solely through the lens of gaps, deficits and shortfalls, and why policy makers and media should focus more on a strengths-based approach: measuring progress within the Aboriginal and Torres Strait Islander population, and celebrating the success achieved. 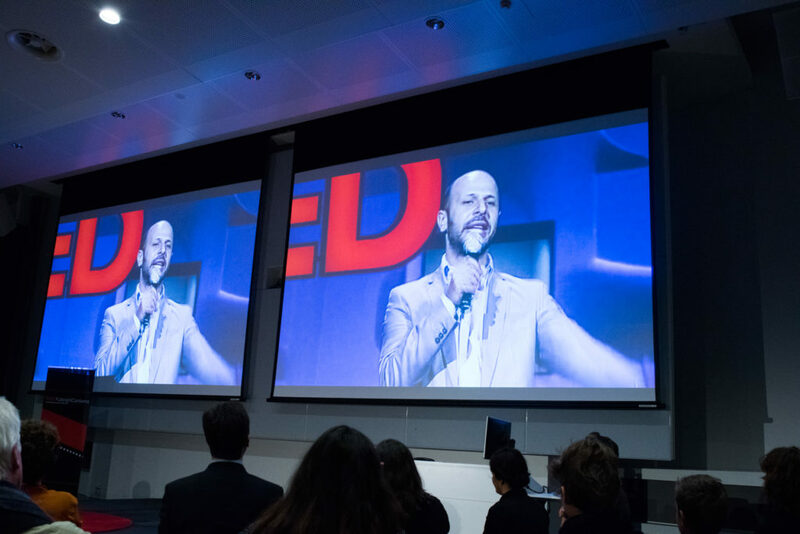 Next up was 2015 Anne Wexler Scholar Vince Redhouse, who delivered a compelling argument for Indigenous self-determination in Australia through the frame his personal experiences of such policies in the United States. Vince suggested that granting Indigenous Australians a much more substantial role in determining, shaping, and implementing the policies that directly affect them could be a far more efficient strategy than the paternal policies implemented in the past. 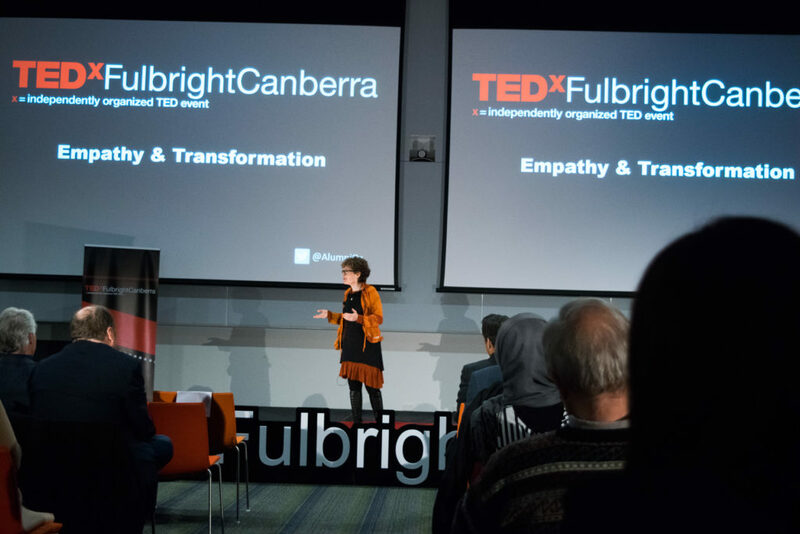 Diane Stone, 1991 Fulbright Postgraduate Scholar then took to the stage to speak about academic freedom, and the potential consequences of limiting this freedom via state control of educational institutions. She used specific, and frightening examples from her experiences in Hungary. 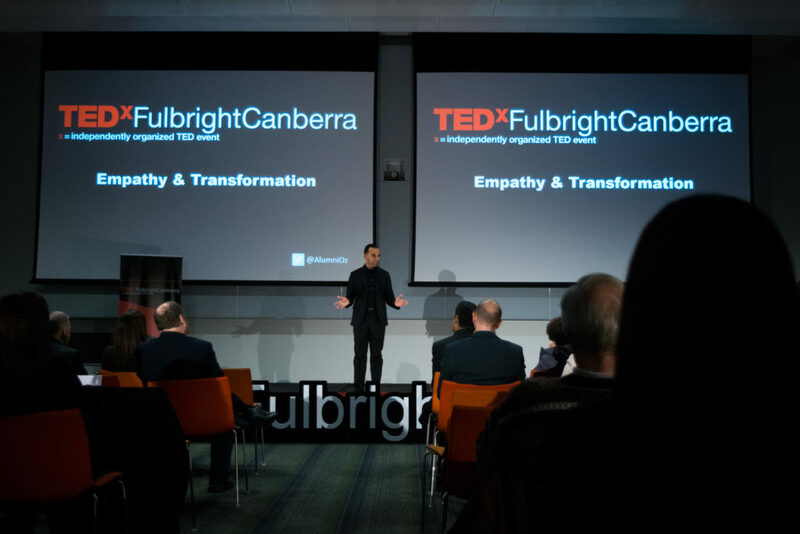 The final speaker of the evening was 2009 and 2016 Fulbright Scholar Manav Ratti, whose rousing, passionate talk offered Ten Ways to Become a Better Person. Manav’s insights into simple, yet profound methods for living the best possible life centred on the concept of empathy, and how viewing the world, and ourselves, through various lenses can increase our personal power and enhance our ability to understand and accept others, thus enabling the best in ourselves, in others, and in our communities. 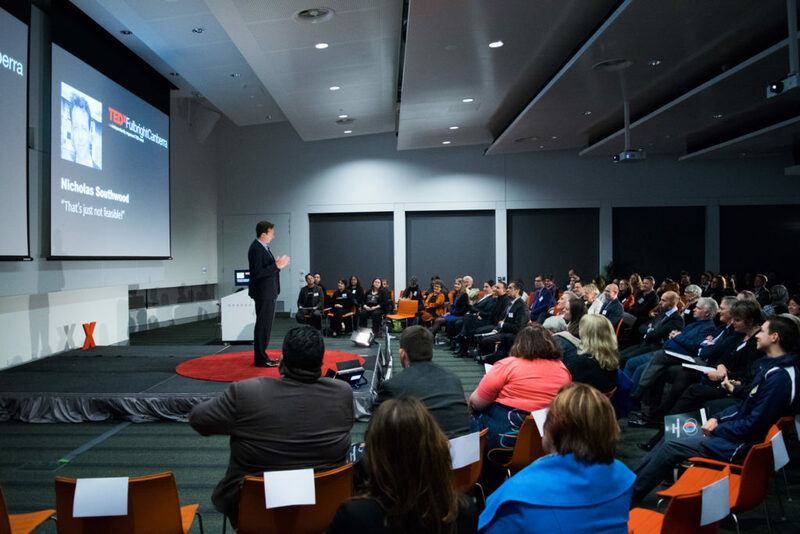 Huge thanks to all of our speakers, coaches, partners, volunteers, and hosts at the University of Canberra. 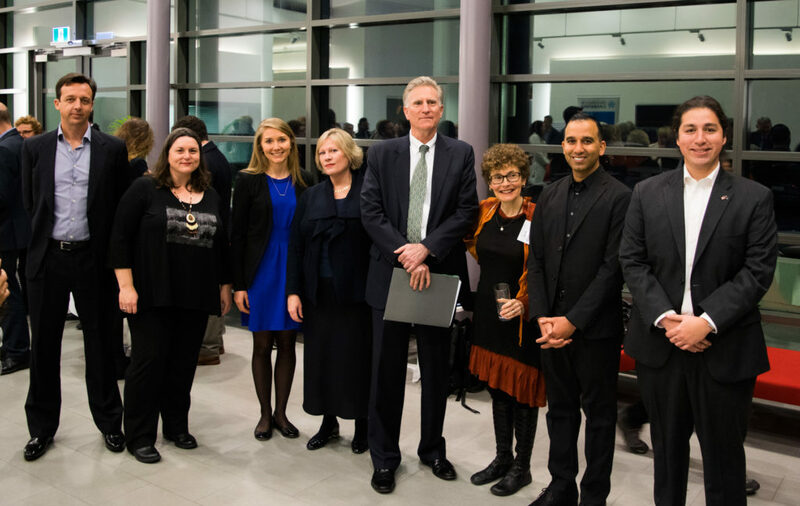 Special thanks to the Public Affairs team at the U.S. Embassy, Canberra for generously funding the event, and providing support to our organisers. 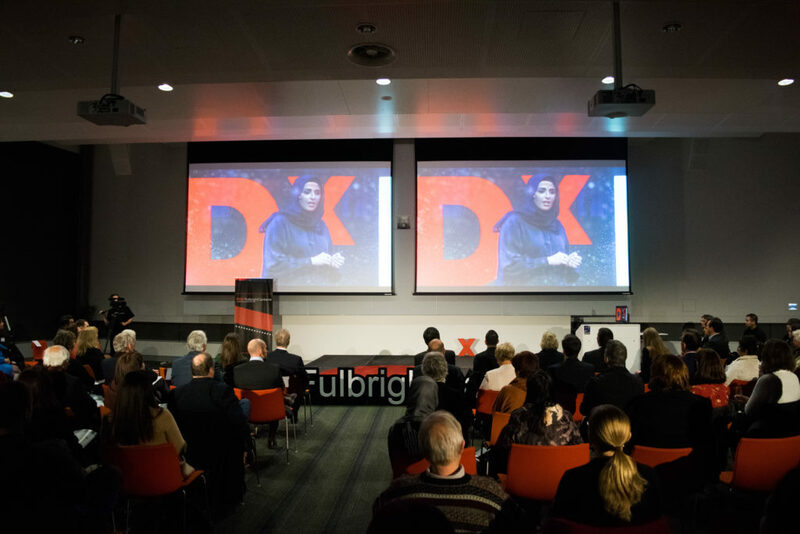 Finally and extra-special shout-out to Fulbright Alumni Relations Manager Pablo Jimenez for his tireless organisational efforts, and key role as MC for the evening.